Substantial evidence demonstrates that amyloid deposition in the cerebral vasculature plays a major role in the pathophysiology of Alzheimer’s disease. 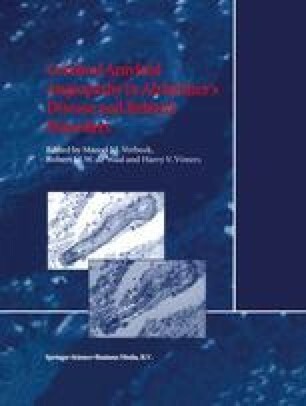 Chemical and immunohistochemical analyses have demonstrated that Aβ40 and Aβ42 peptides are present in vascular amyloid deposits with a preponderance of the former peptide. The accumulation of cerebrovascular amyloid leads to obliteration of capillary lumen and destruction arterial myocytes resulting in hypoperfusion and loss of control of cerebral blood flow. Post-translational modifications such as racemization, isomerization, cyclization, oxidation and N-terminal degradation largely contribute to the insolubility and proteolytic resistance exhibited by vascular Aβ filaments. The strong association of vascular Aβ with other proteins, carbohydrates and lipids results in additional amyloid stability. There appears to be a strong positive correlation between the magnitude of Aβ40 deposition and the dosage of apolipoprotein E4.